Just saw this post that the NY Times Reader for the Mac is available - I'm interested in seeing how the Silverlight version works. I've been using the WPF version for the Seattle Post-Intelligencer and really like the ease of reading articles. I'd like to see some research journals and magazines adopt this model as well. 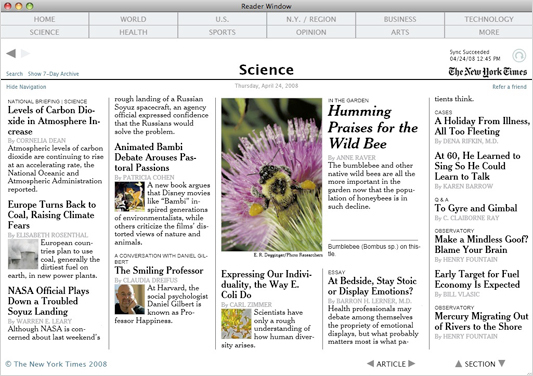 The NY Times has now released a beta edition of the Times Reader for the Mac. What's interesting about this version is that it is built using Silverlight in combination with Cocoa (the native Mac programming language), and the Safari WebKit. The application runs as a stand alone desktop application on the Mac and is very similar to the WPF PC version. Tim Heuer posted about it on his blog. The NY Times folks have shared some technical details over on their blog.